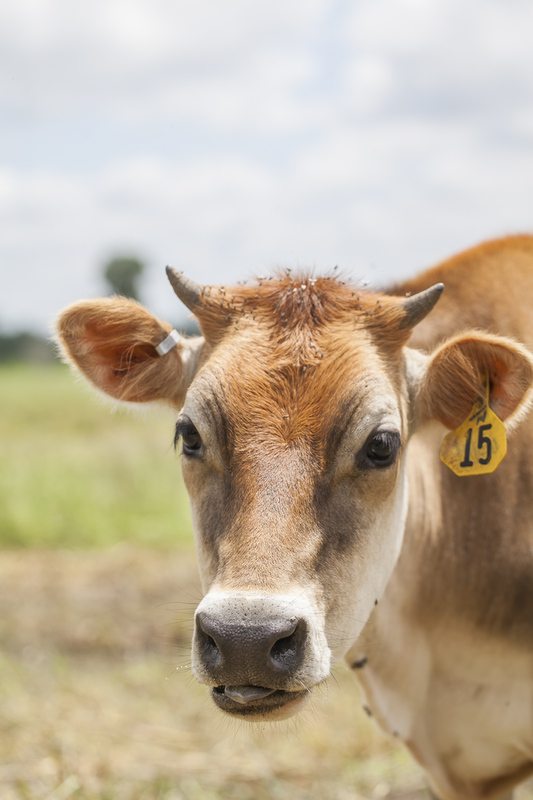 When I tell people I am a farm photographer, often times I get a curious look. 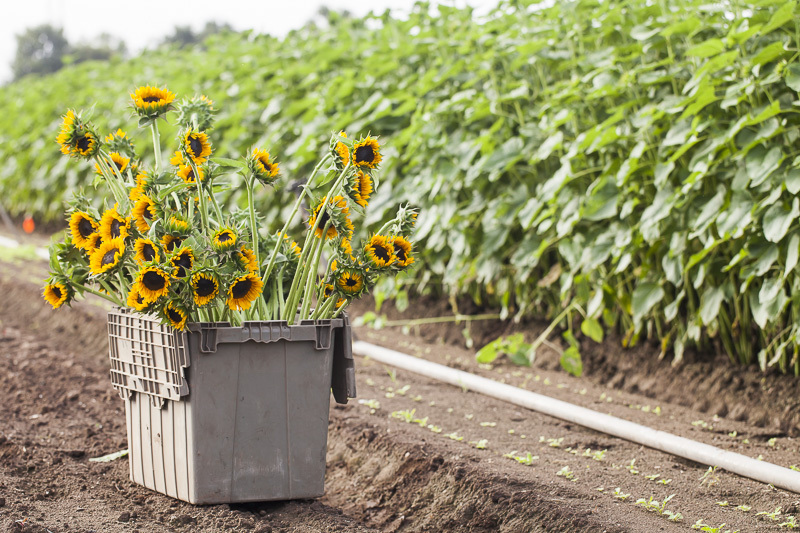 Maybe I should say agricultural marketing photographer, I'm not sure. 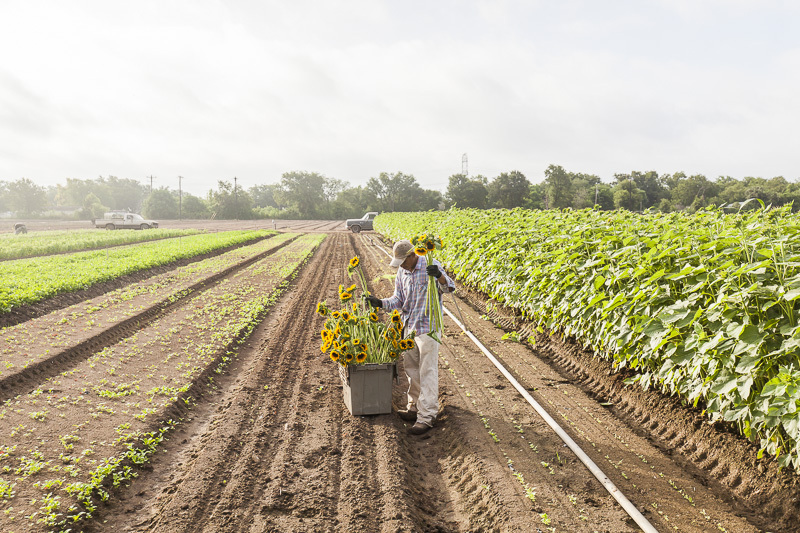 My view is if you've never hear of such a profession that's great because there will most likely be less competition. 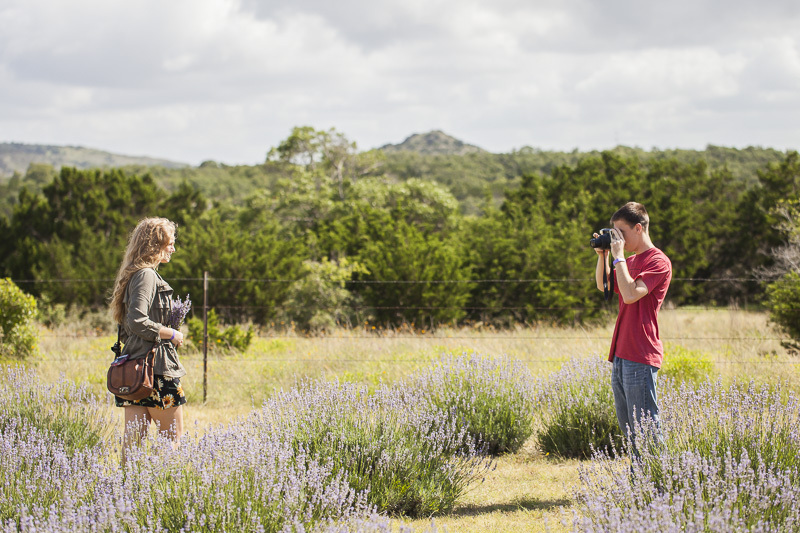 It's a niche that I really enjoy and am determined to develop and expand. 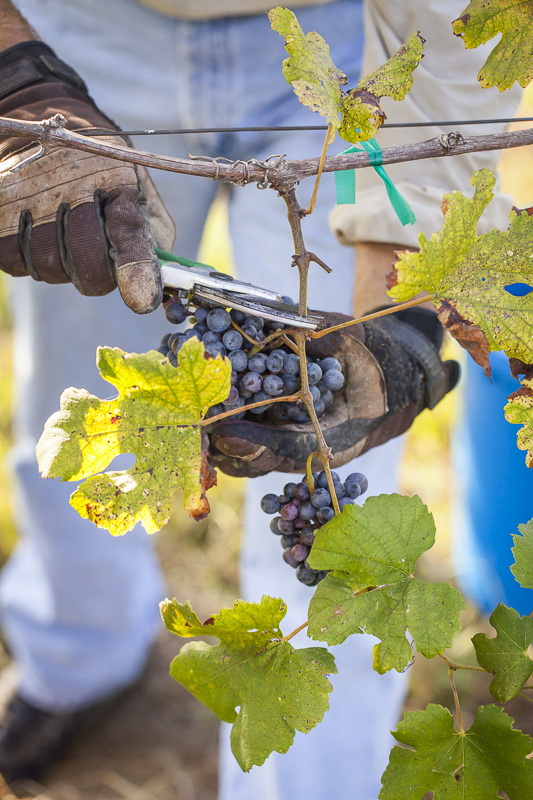 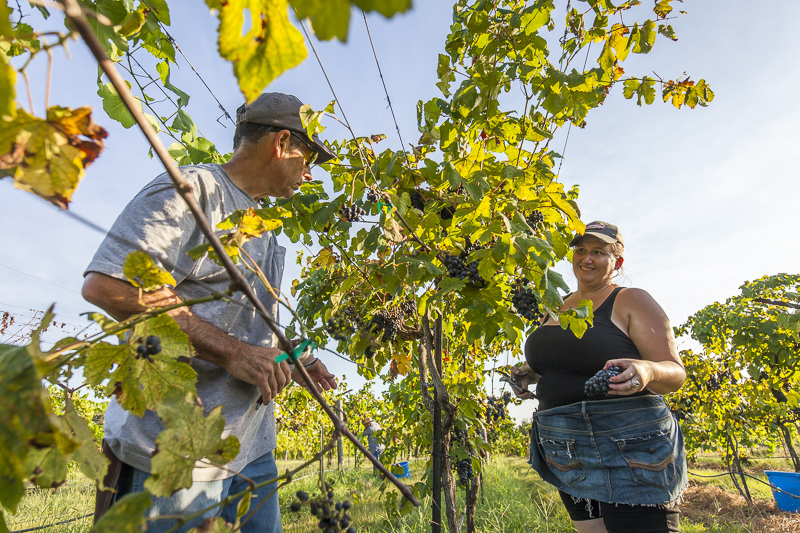 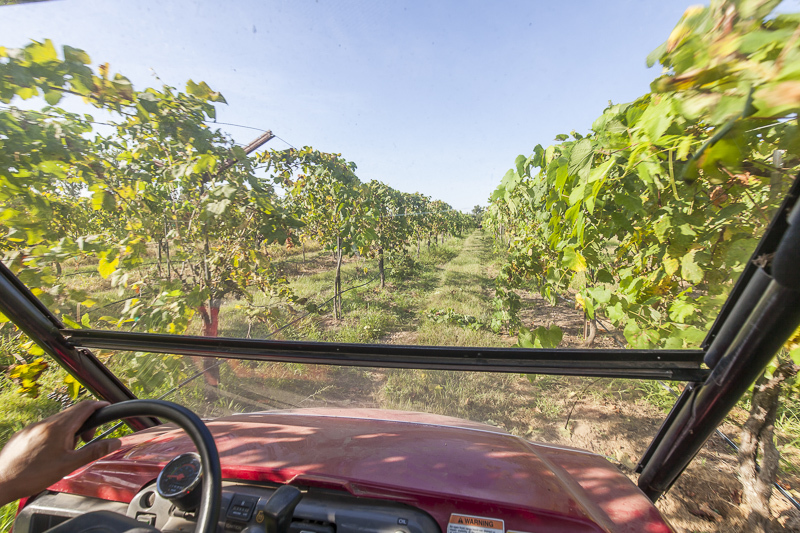 The fact is that farms and vineyards are businesses that need images to promote themselves and share what they are up to just like any other. 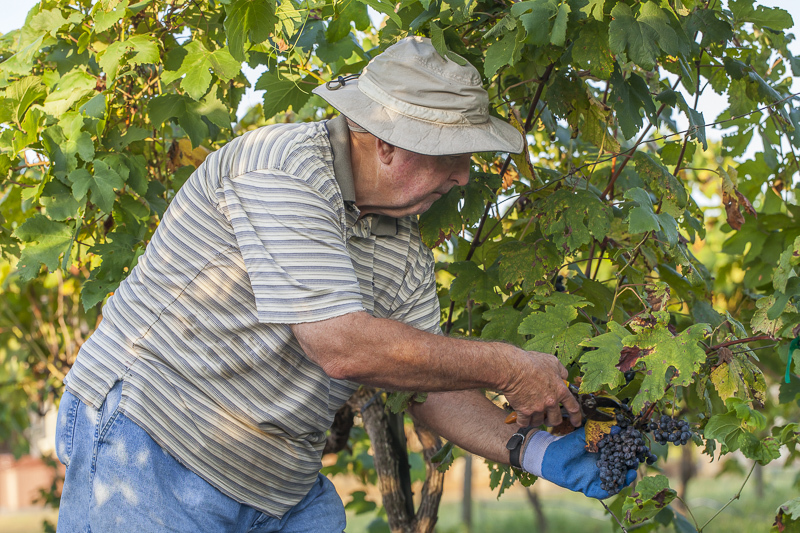 Farmers deserve and have earned my respect over the years. 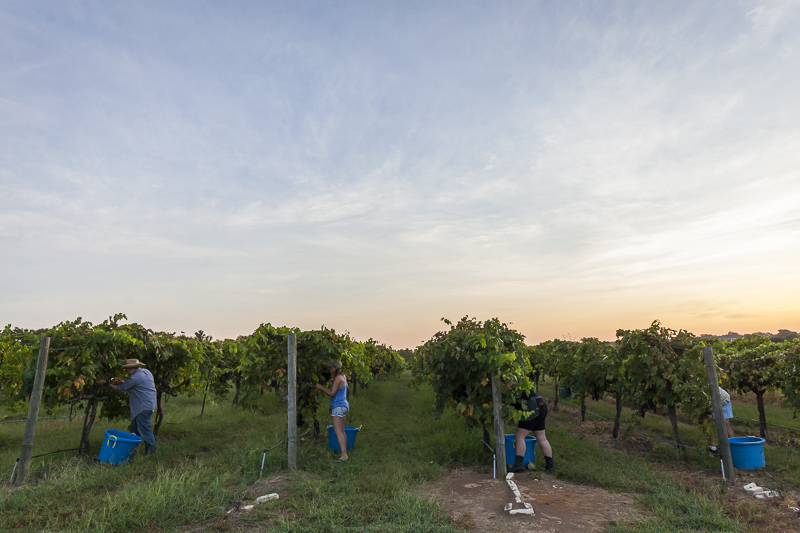 Fortunately, I have been in a position to witness to their hard work and also enjoy the fruits of their labors. 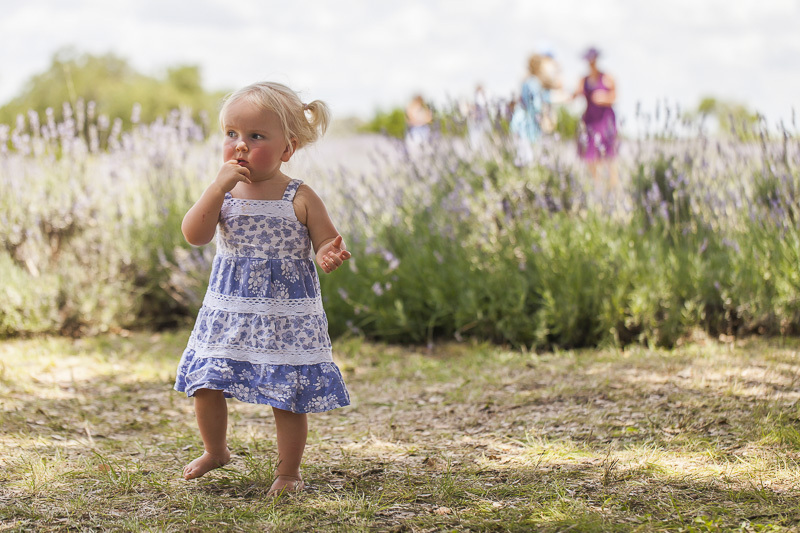 Helping them to be more successful with the help of photography is satisfying and I feel that I am making a positive contribution to the overall good. 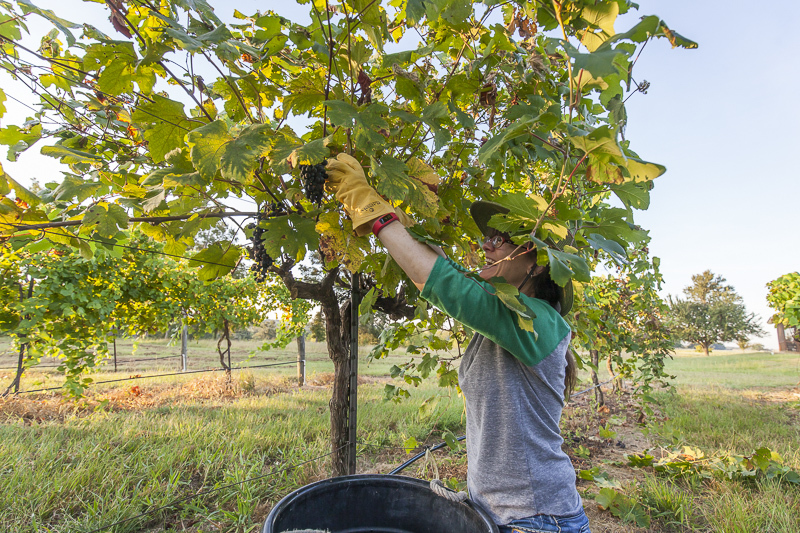 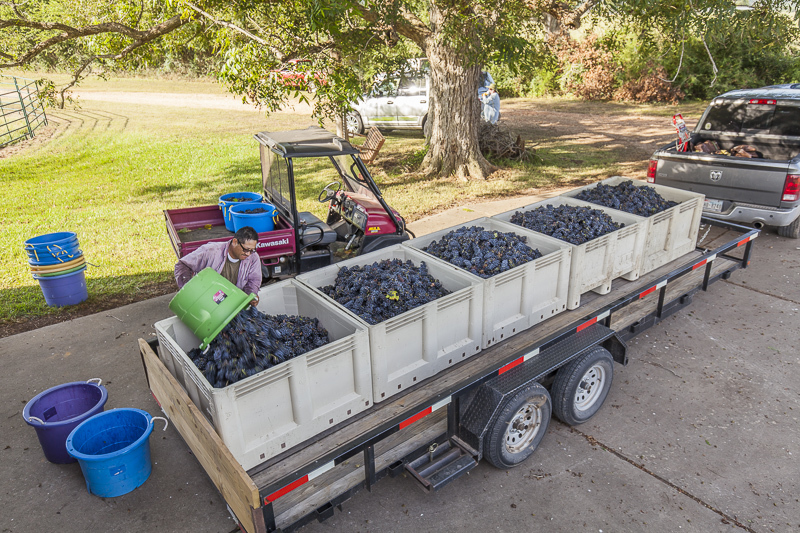 As fate would have it, I had an opportunity to photograph a grape harvest at a vineyard near La Grange, TX at the beginning of August. 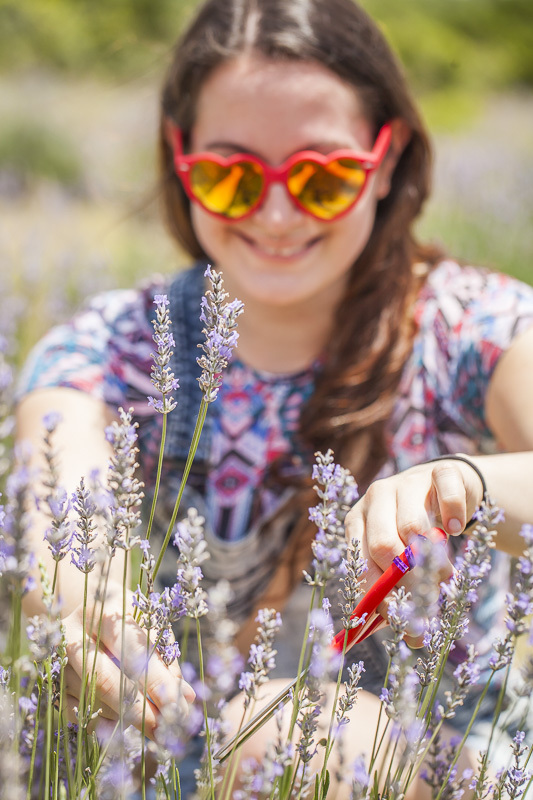 My first! 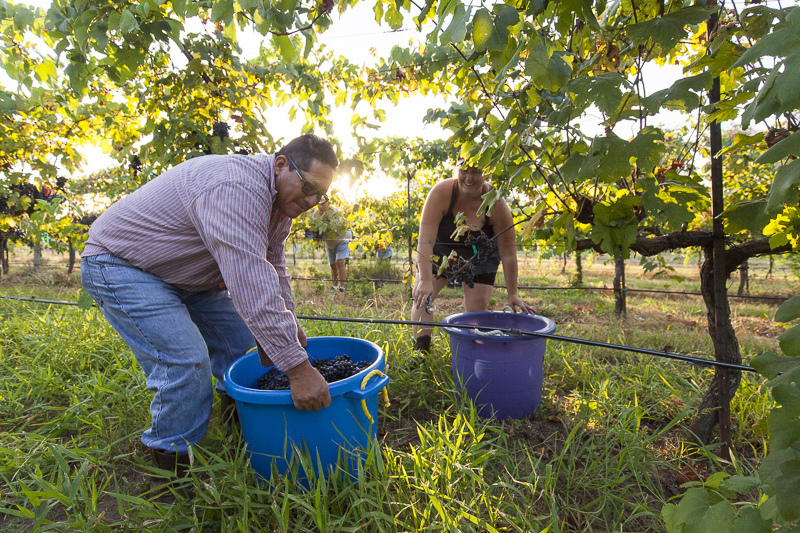 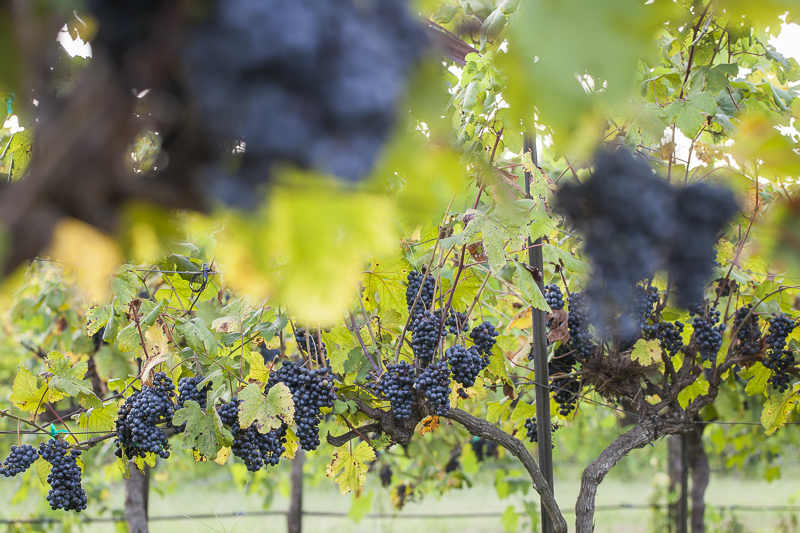 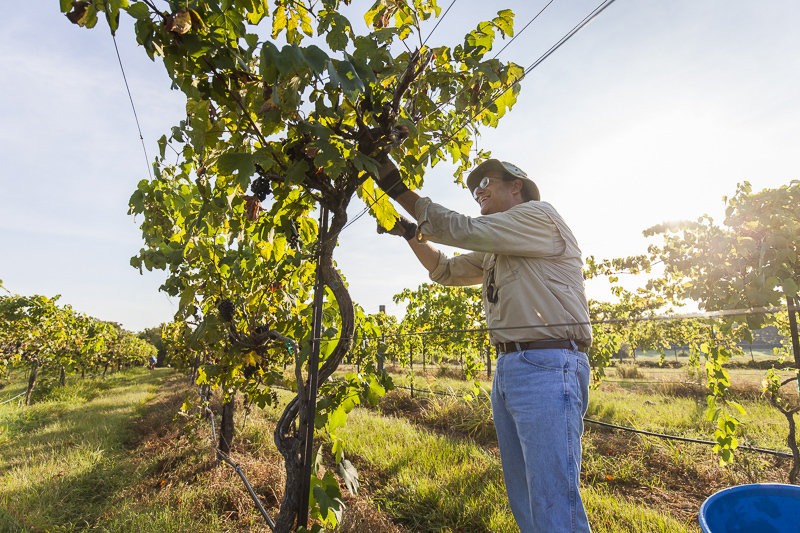 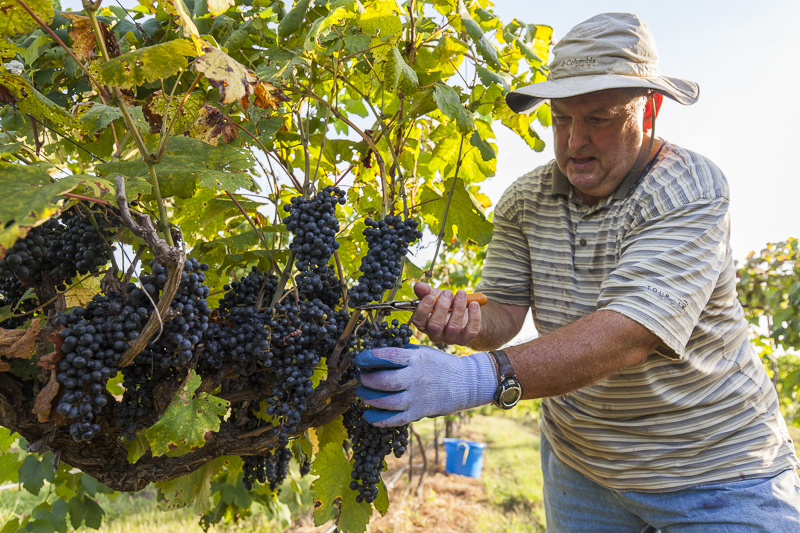 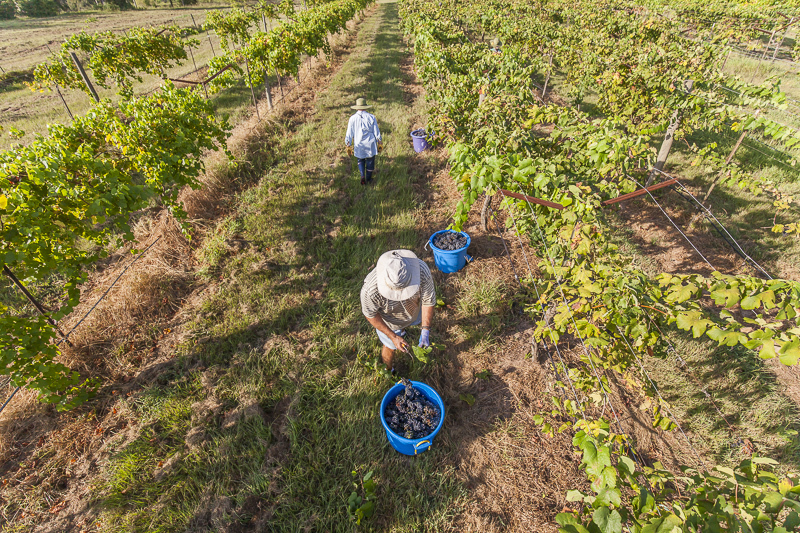 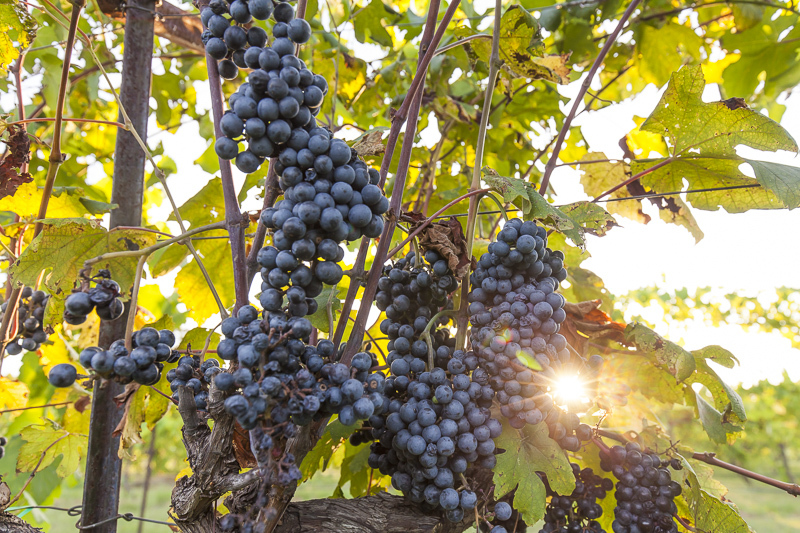 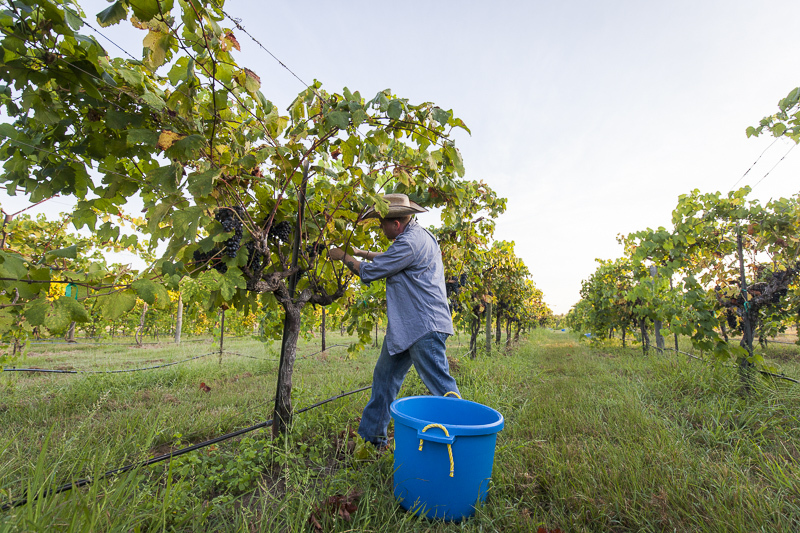 In case you’re not aware, central Texas is booming with new vineyards and is continuously competing for wine tourism traffic with Napa Valley and Sonoma in Northern California. 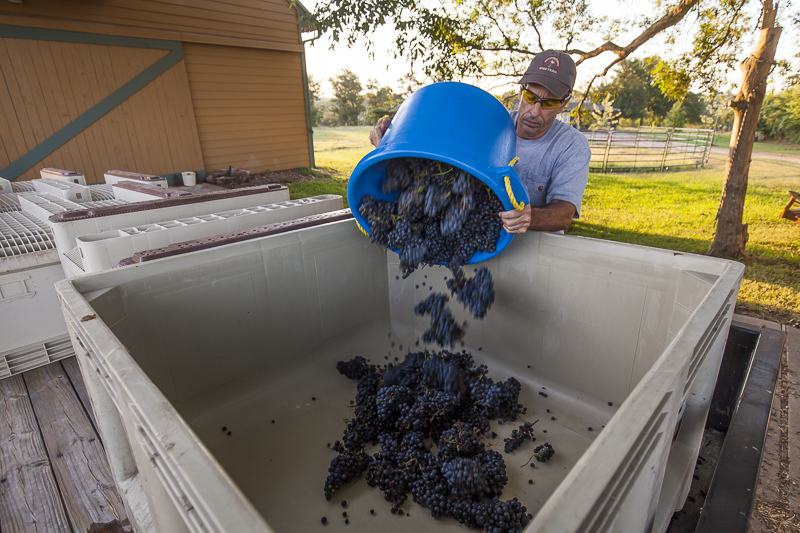 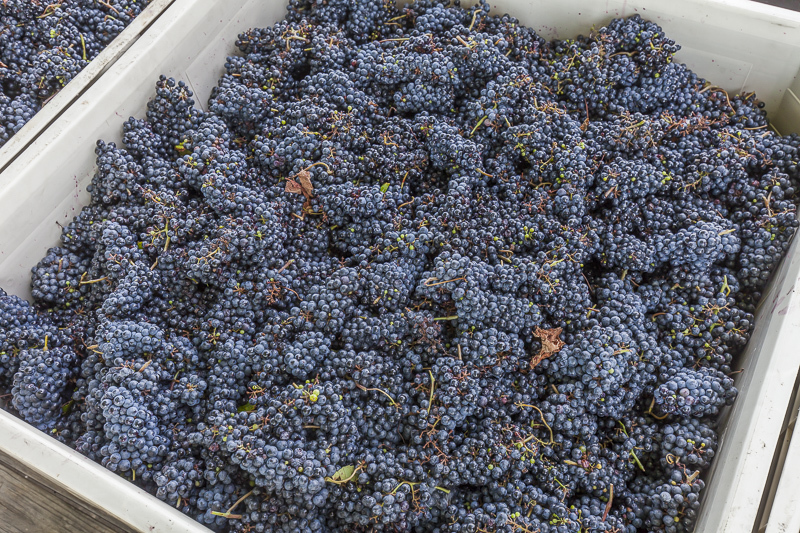 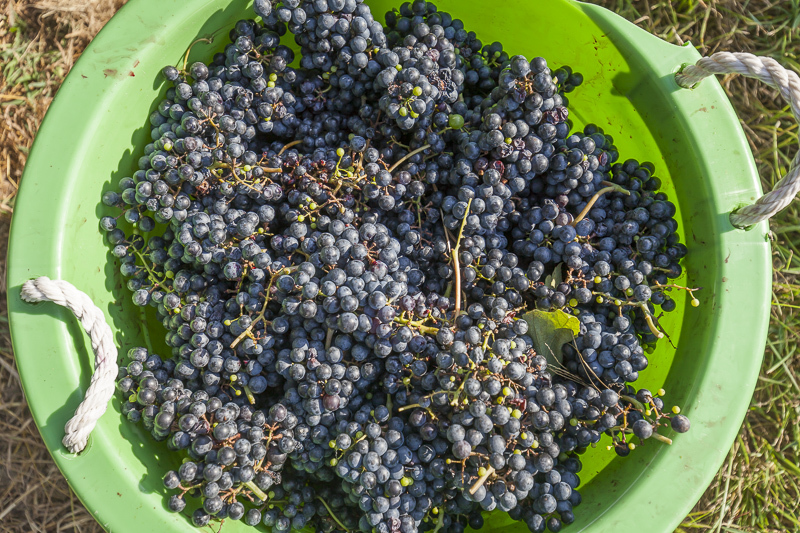 Black Spanish Grapes do well in the Texas Hill Country, and this years harvest was a nice one. 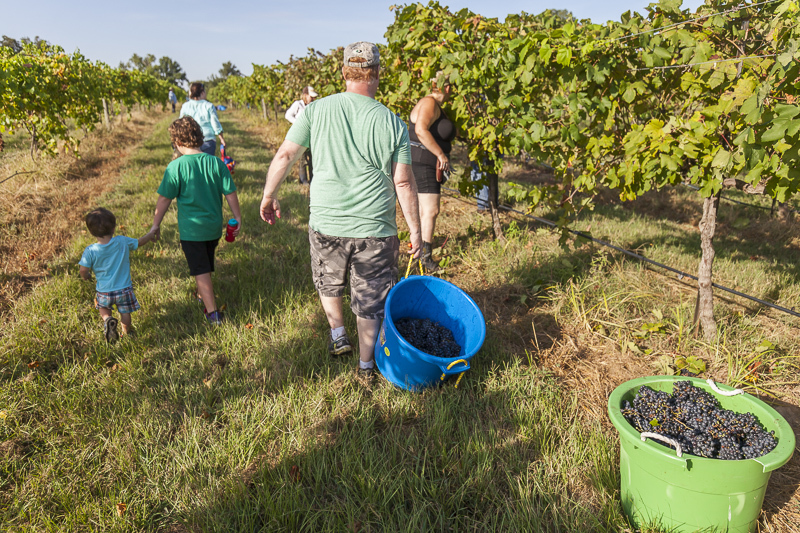 Thanks again to everyone that came out to volunteer picking grapes and to Blue Mule Farm and Roahn Meadery for making it all happen. 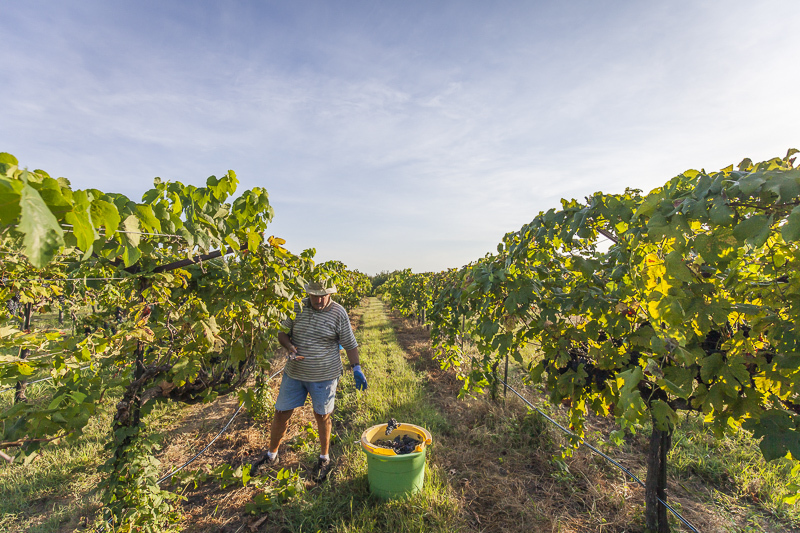 Please share this post and, if you own a winery or a farm, I would be happy to pay you a visit and help you create some beautiful photos. 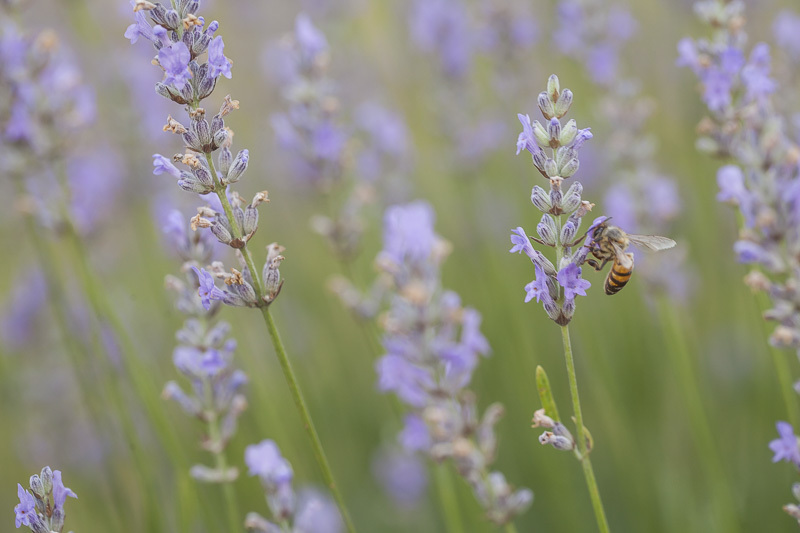 A honey bee lands on a lavender plant. 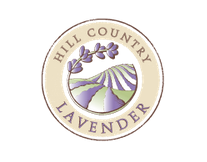 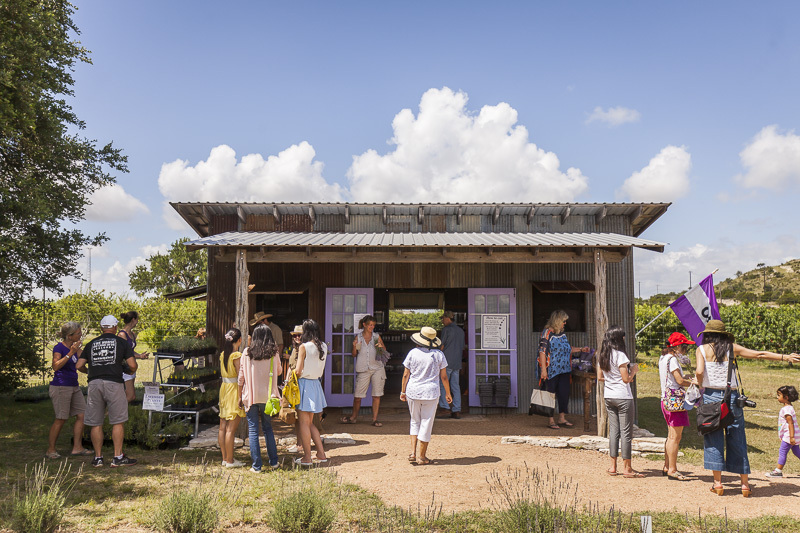 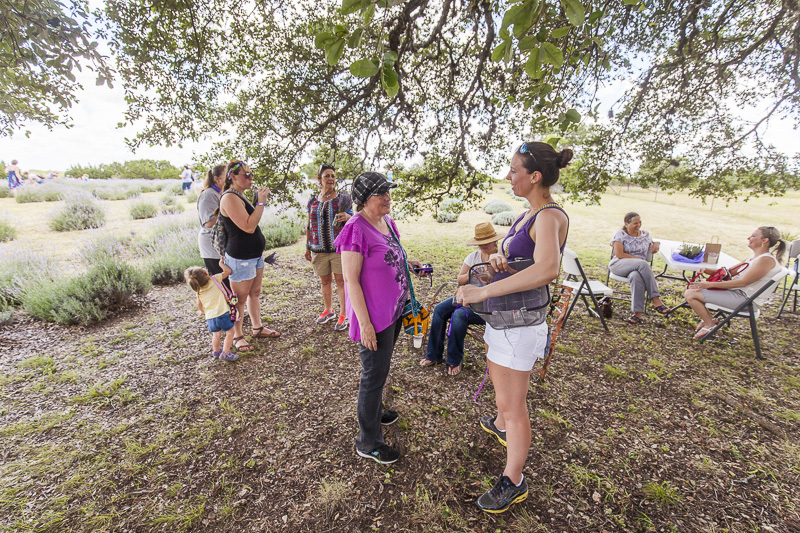 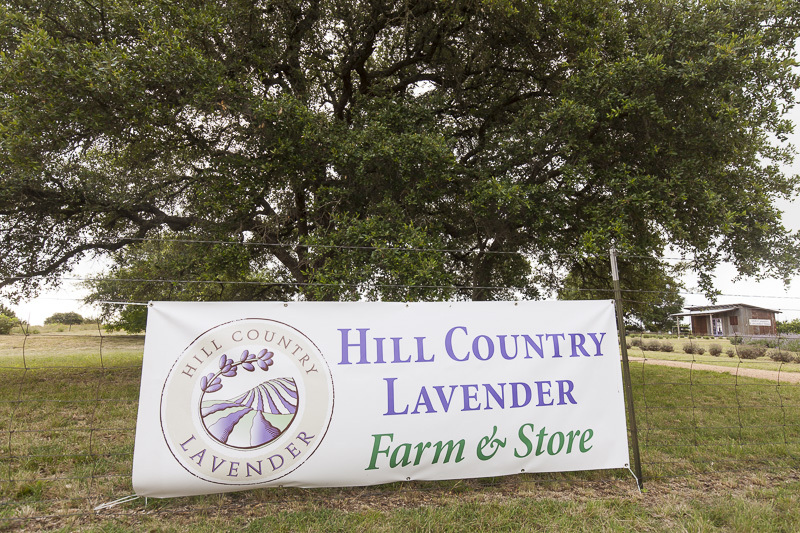 This past February I taught a farm photography class at the US Lavender Conference which is where I met Tasha Brieger, the owner of Hill Country Lavender. 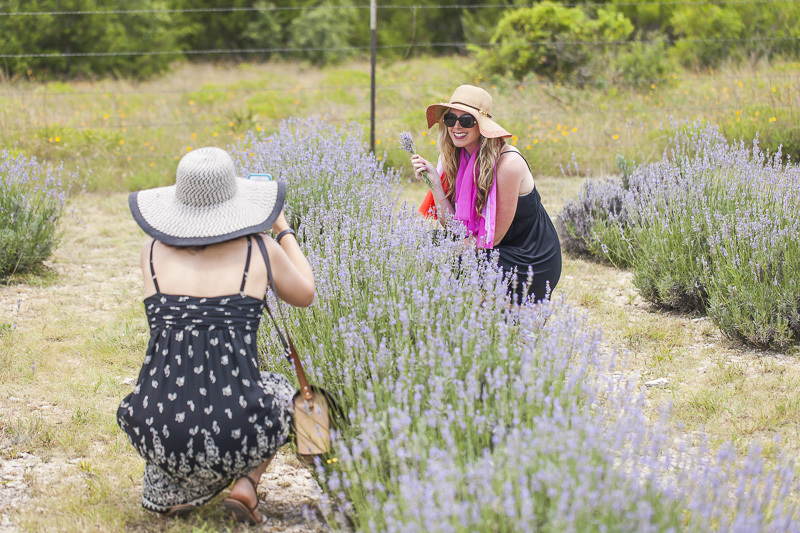 Tasha invited and hired me to document all of the activity at the farm, during the Blanco Lavender Festival, which included people cutting lavender, shopping, and generally just enjoying themselves. 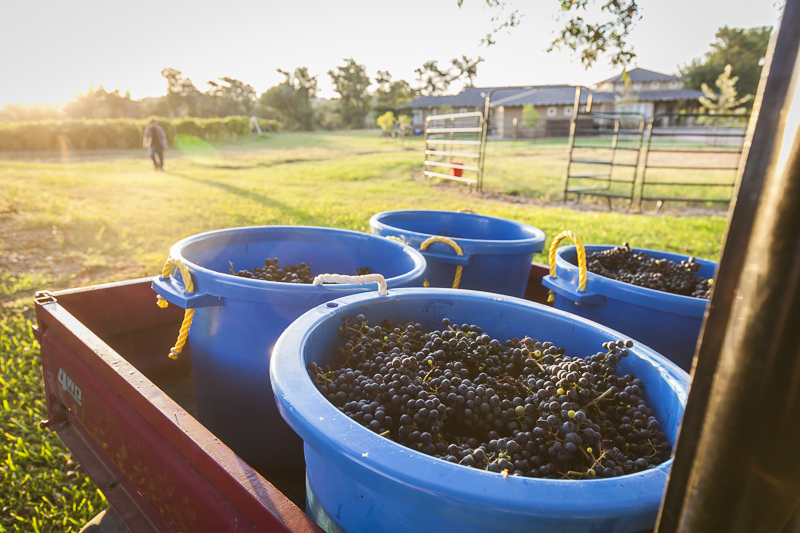 It was without a doubt one of the busiest days of the year. 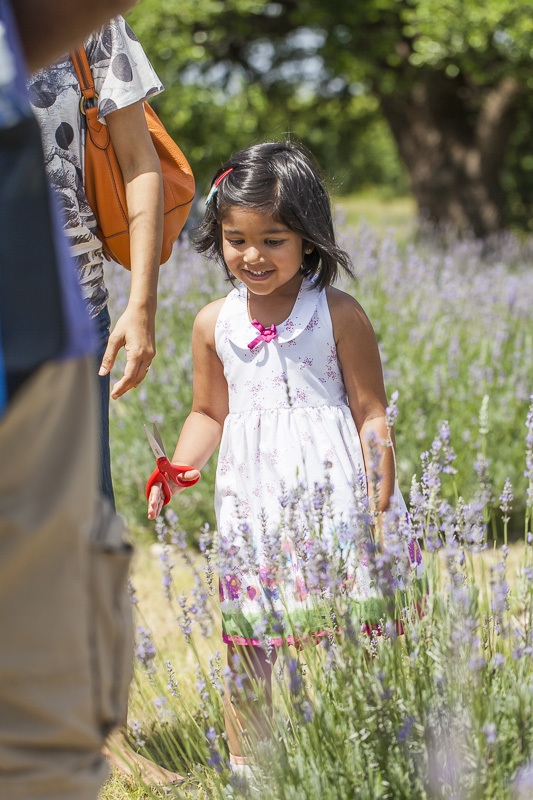 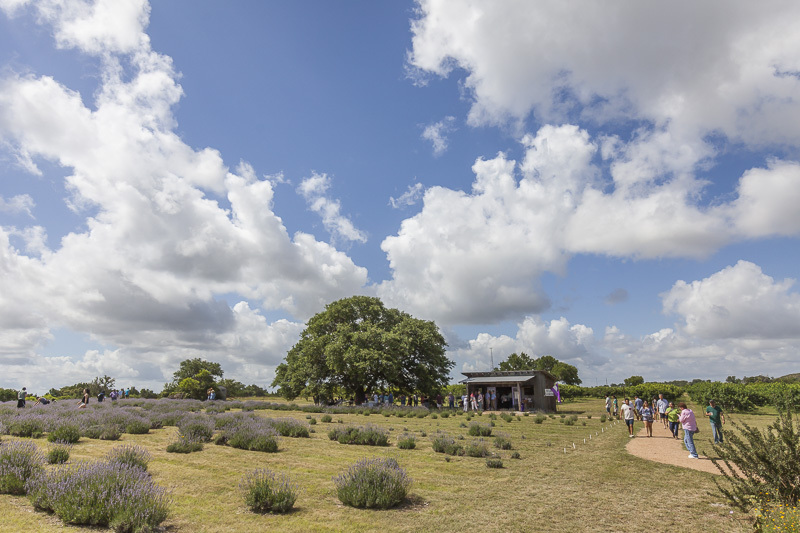 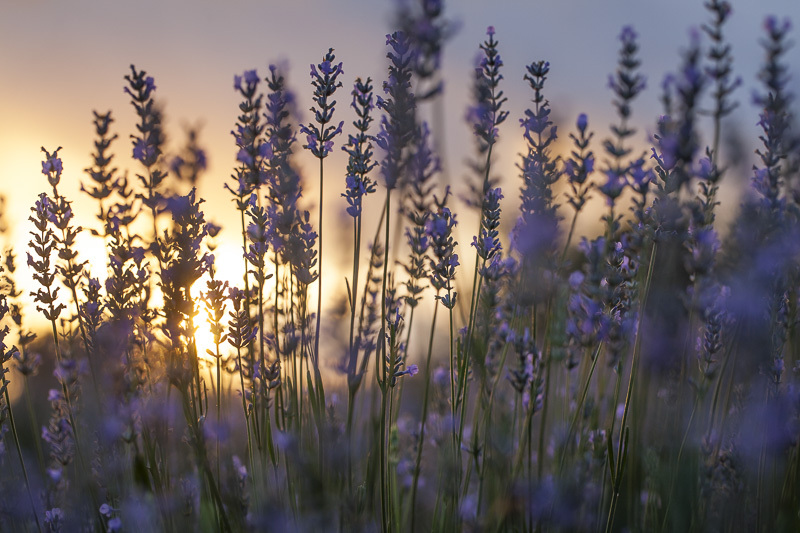 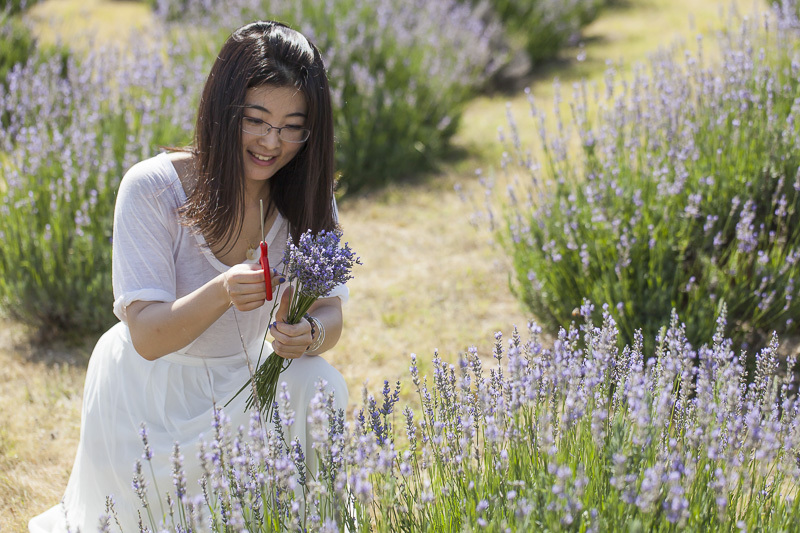 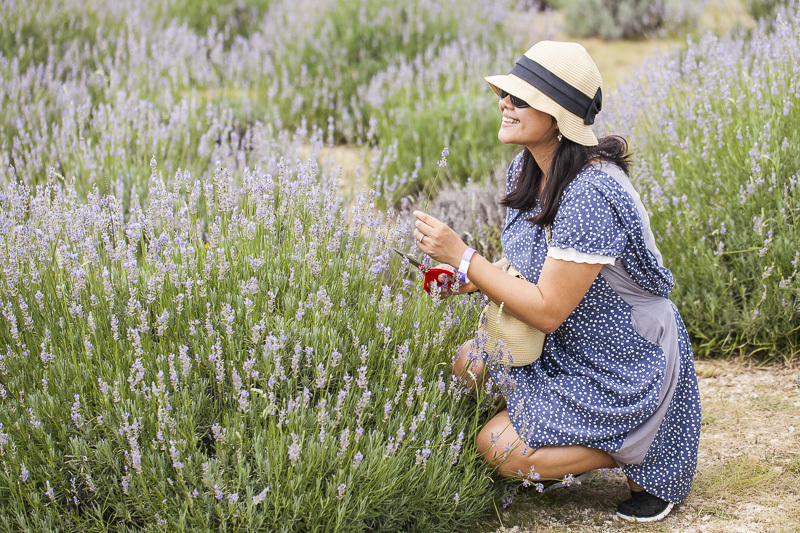 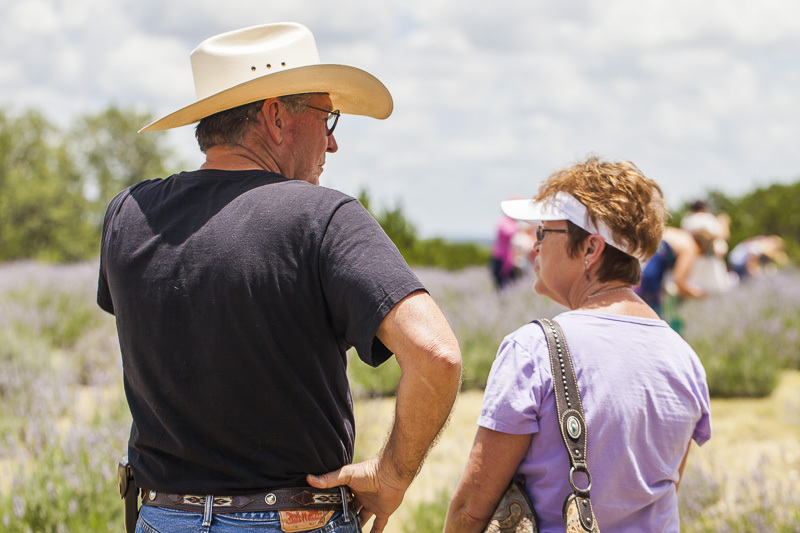 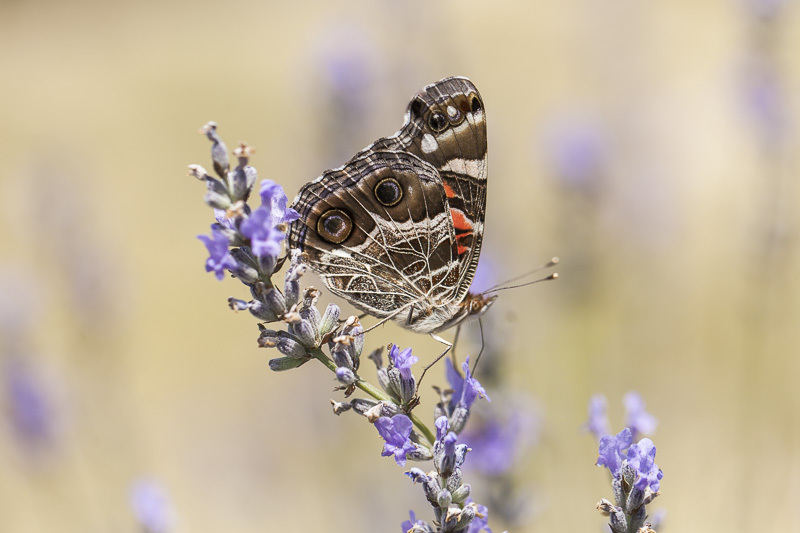 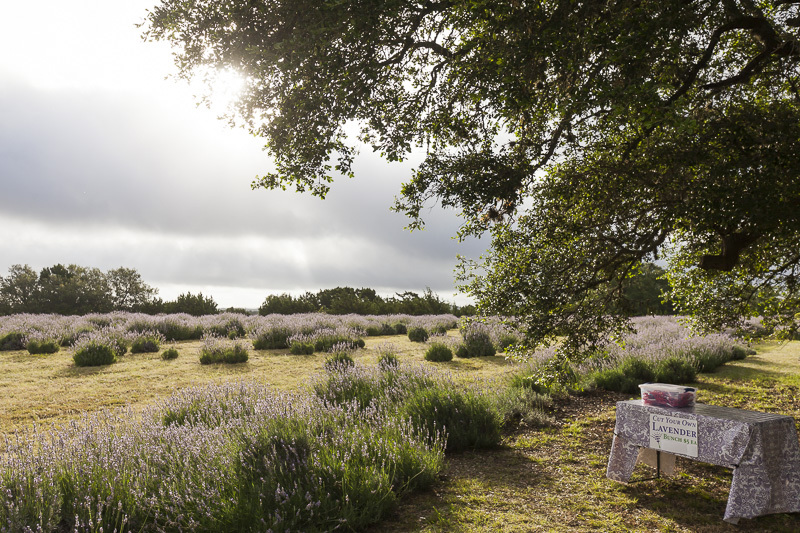 Having never been to a lavender farm, I was unsure what to expect, but it turned out to be a great experience, and the many people who attended had a wonderful time. 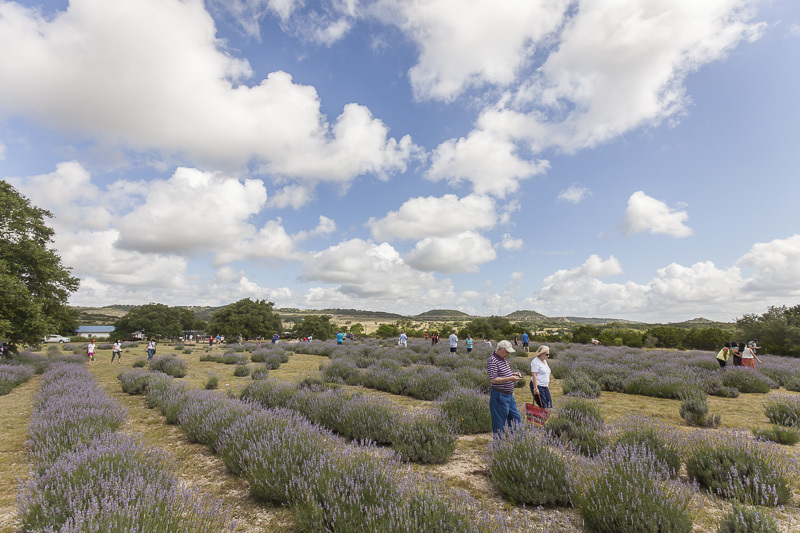 In the end, it was a lot of fun to document the day’s activities and, of course, the scent of the lavender was wonderful and relaxing the whole time. 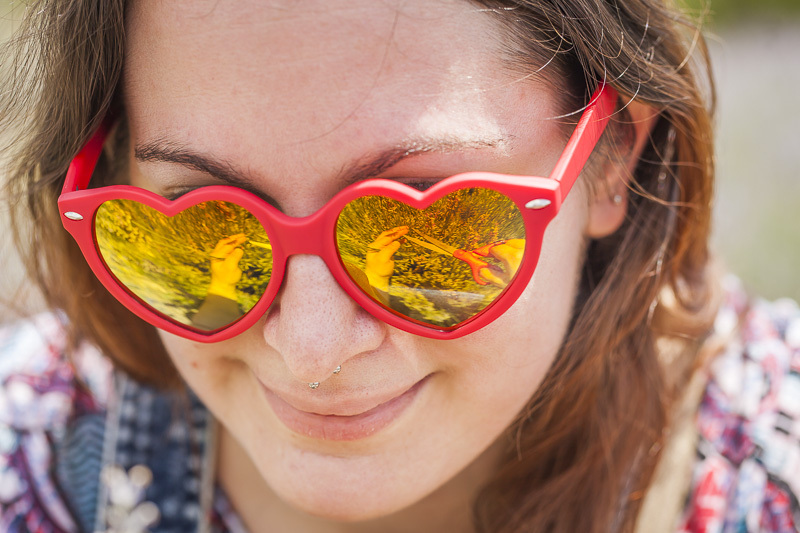 Below are some of my favorite photos from the day. 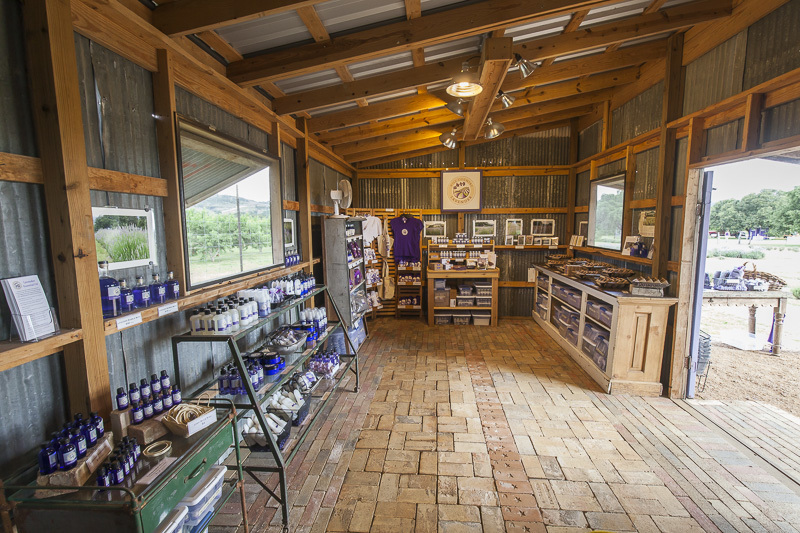 The farm is not open year round but if you are in Blanco you can find their great products at Brieger Pottery downtown or online. 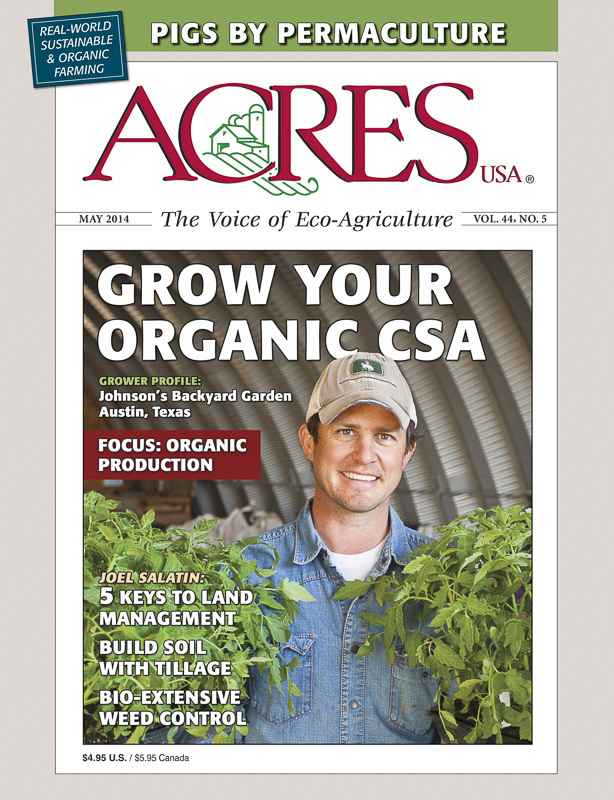 There is a great magazine that is published right here in Austin, TX and one in which I have been fortunate enough to work with on a regular basis. 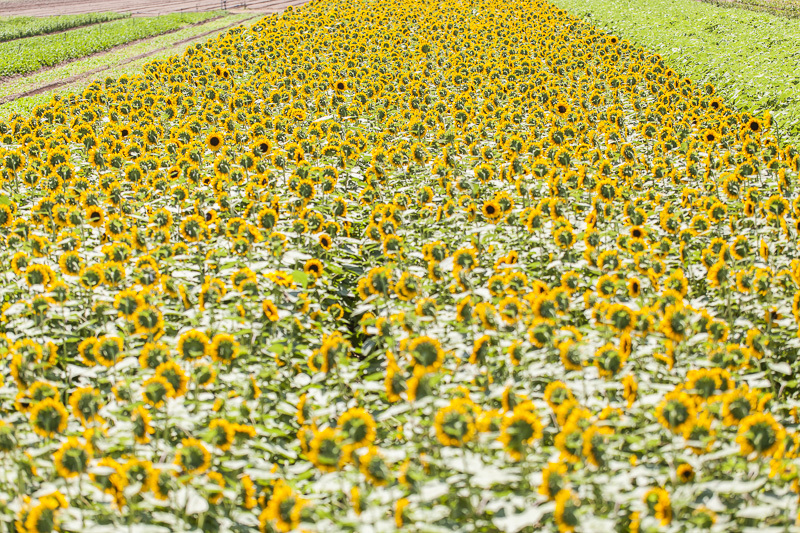 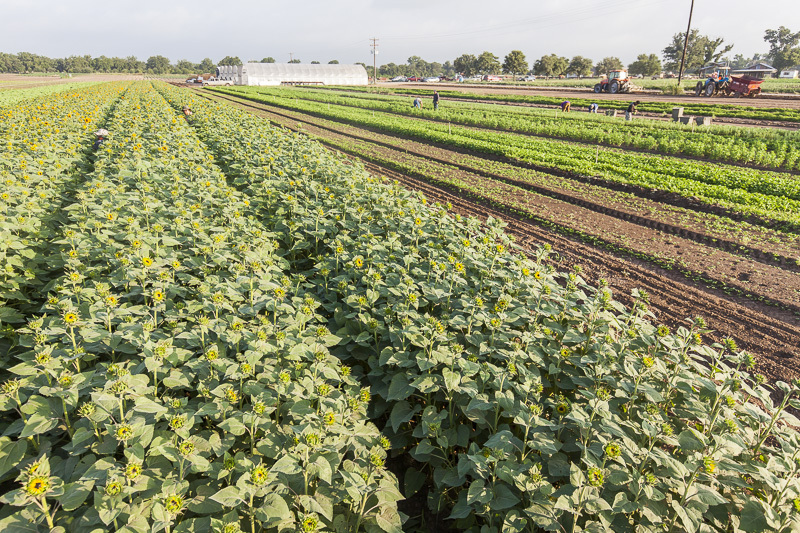 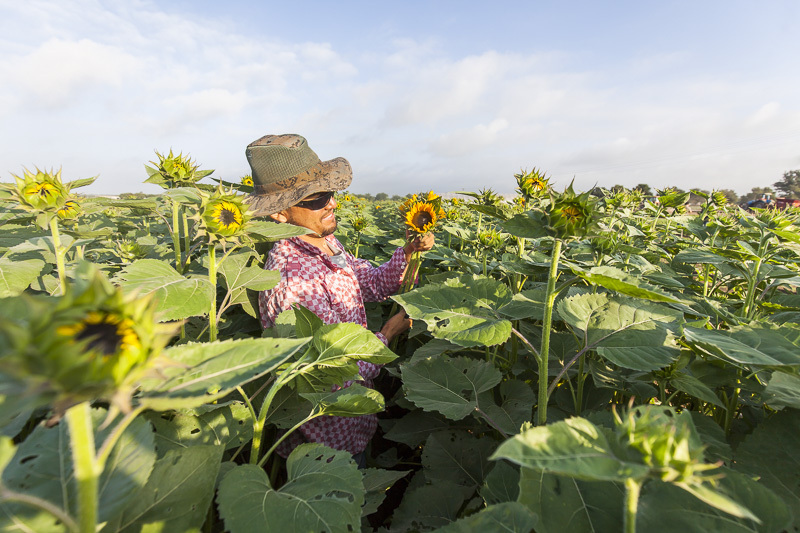 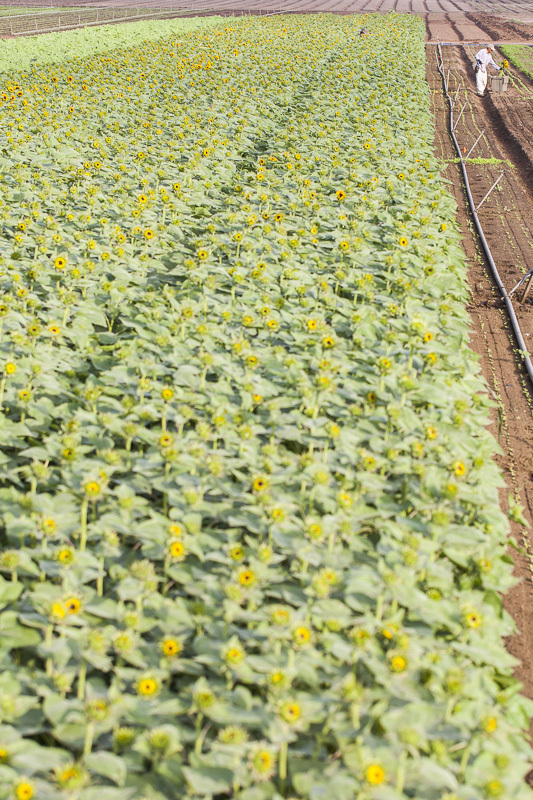 For over forty years Acres U.S.A. has been sharing the benefits of sustainable agriculture to a national audience. 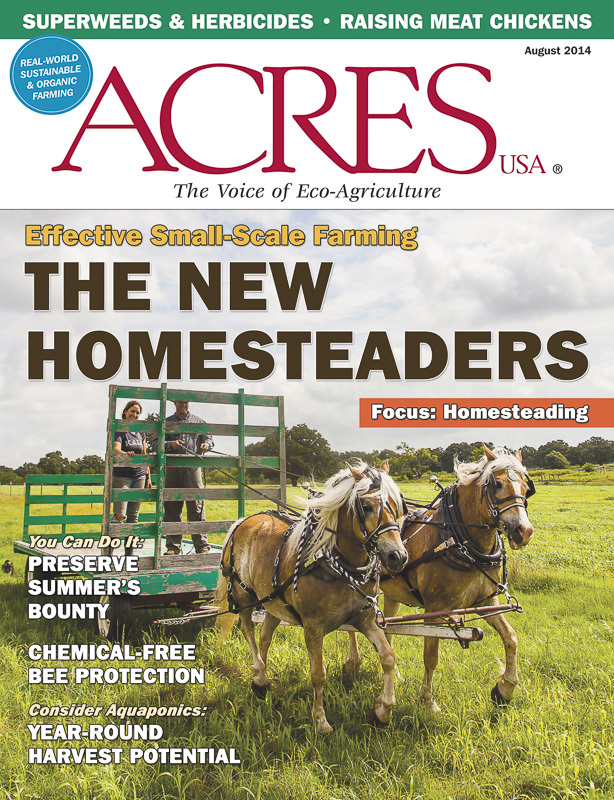 We started collaborating over a year ago and so far I have provided them with six covers as well as photos for several of their articles. 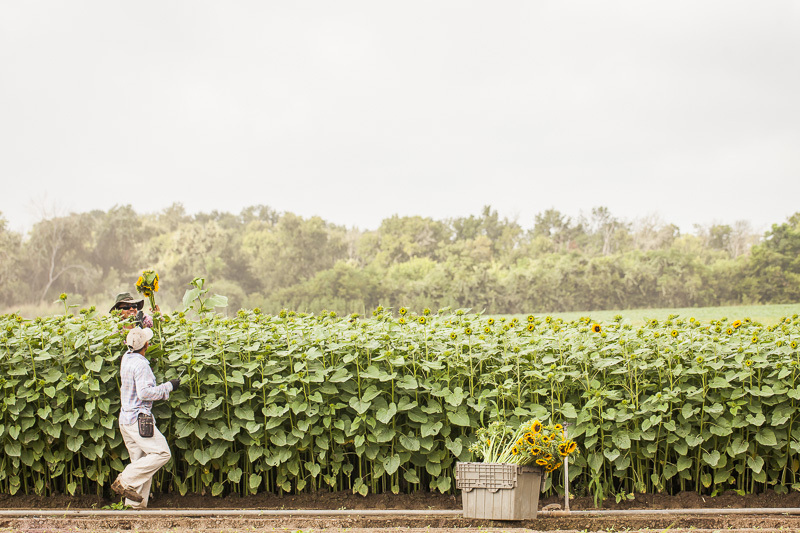 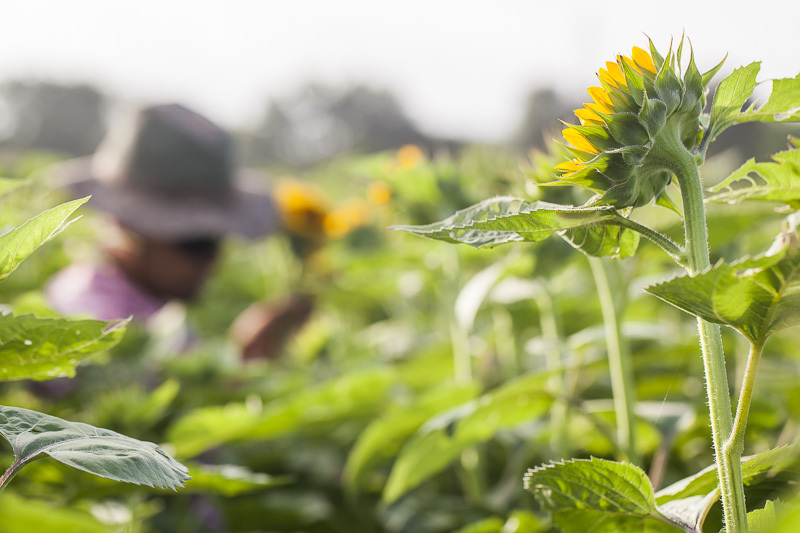 This has been a wonderful opportunity for me to branch out from the photography of vegetables at JBG Organic, and has given me a reason to travel to other farms in an effort to expand my portfolio and relationships. 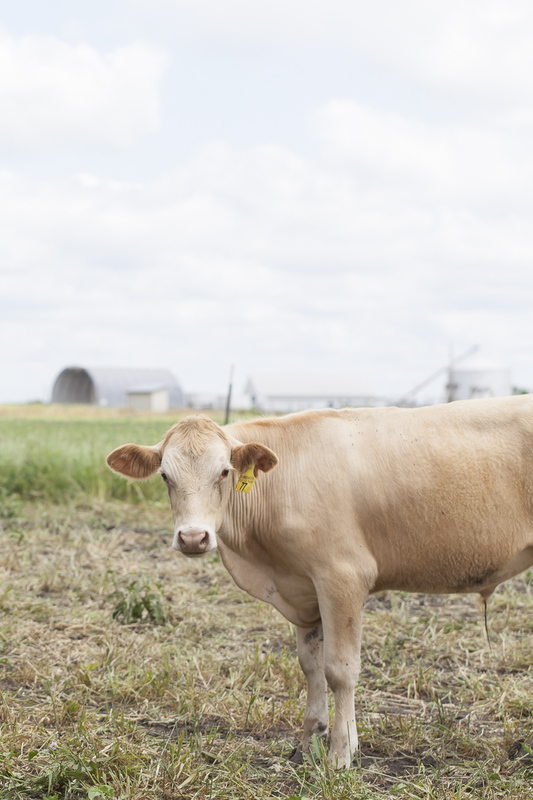 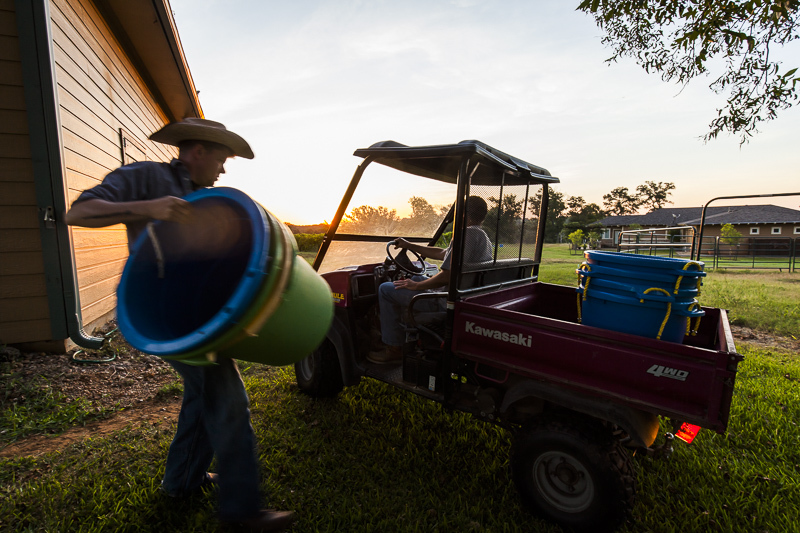 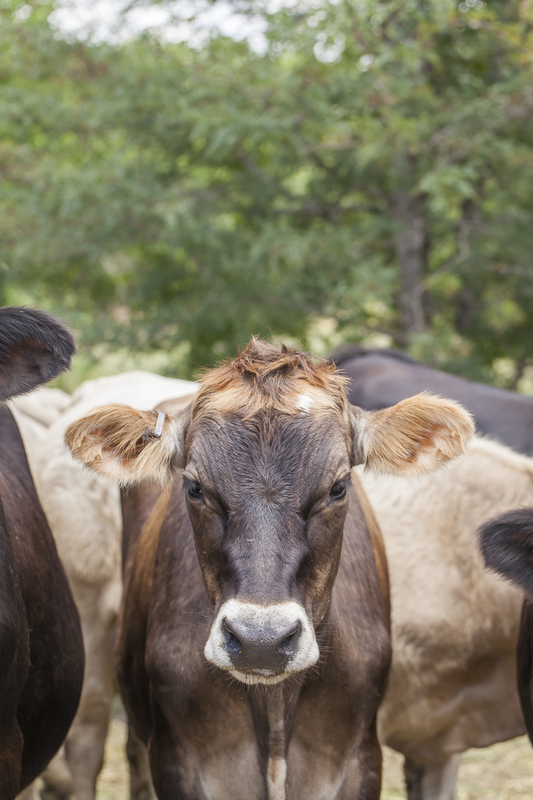 During my two trips out to Sand Creek Farm in Cameron, TX, I was introduced to dairy cattle, draft horse, and aquaponics, for last years livestock and homesteading issues. 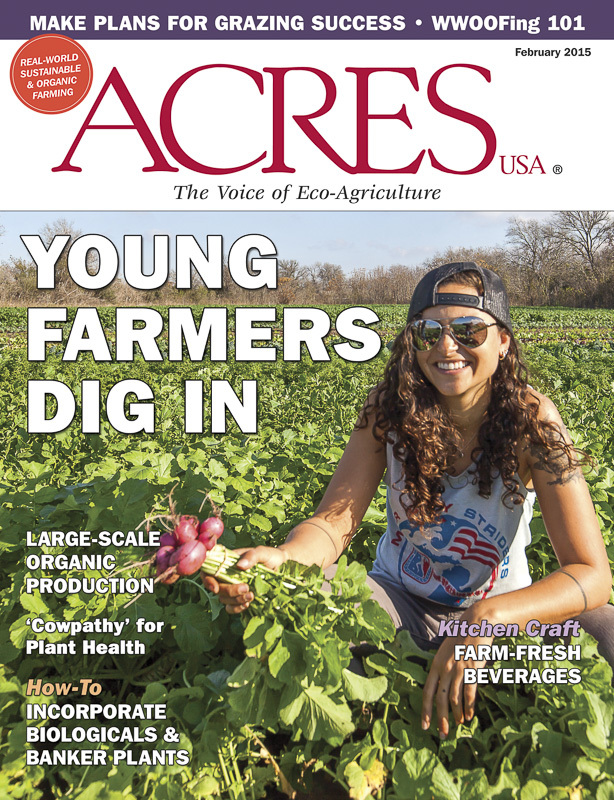 Next I spent some time with the students at Farmshare Austin for the young farmers issue. 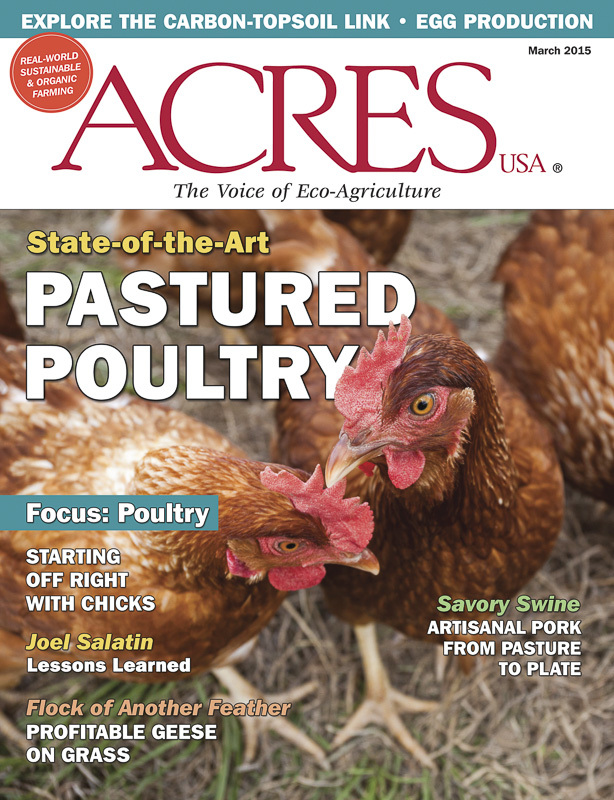 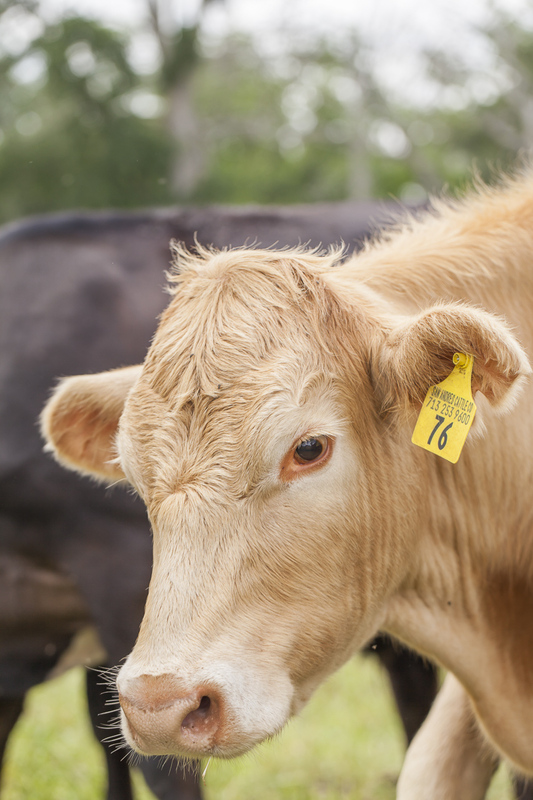 Most recently, I visited Richardson Farms in Rockdale, TX for this years livestock issue. 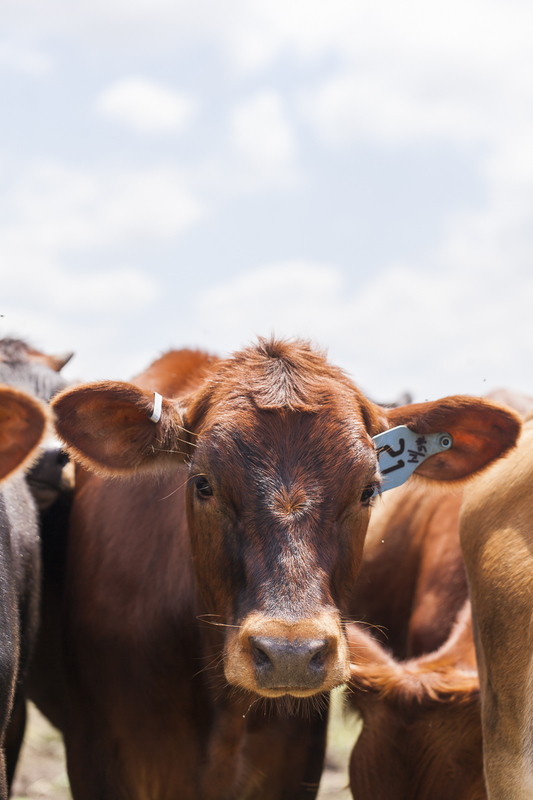 Here are the other five covers and a selection of cattle from Richardson Farms. 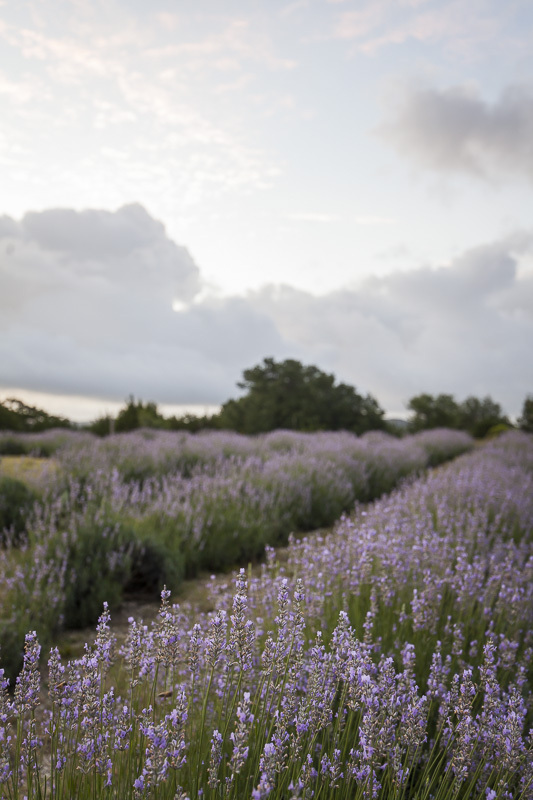 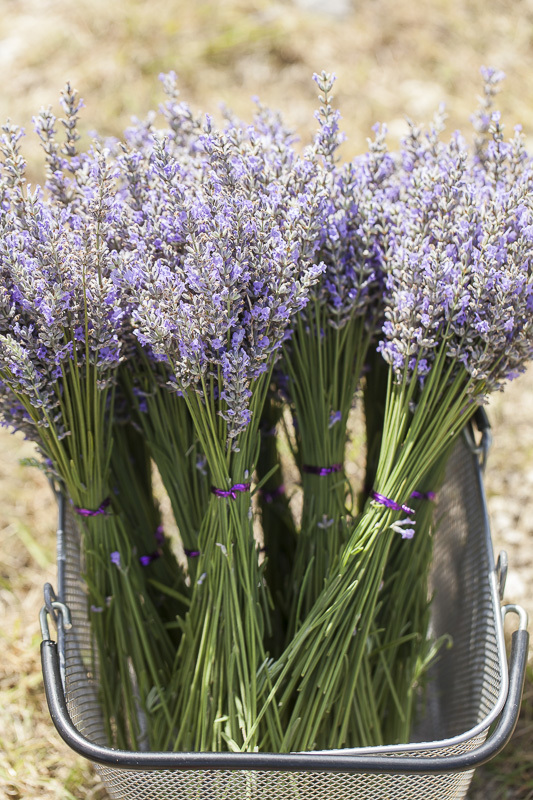 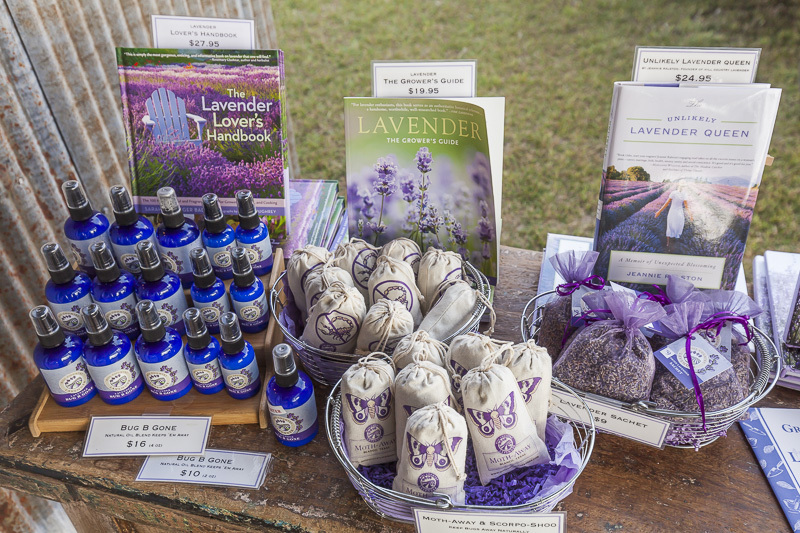 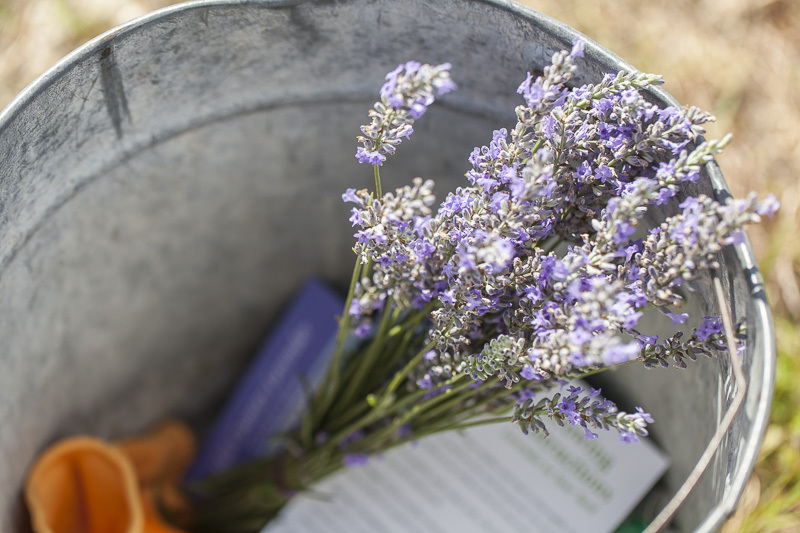 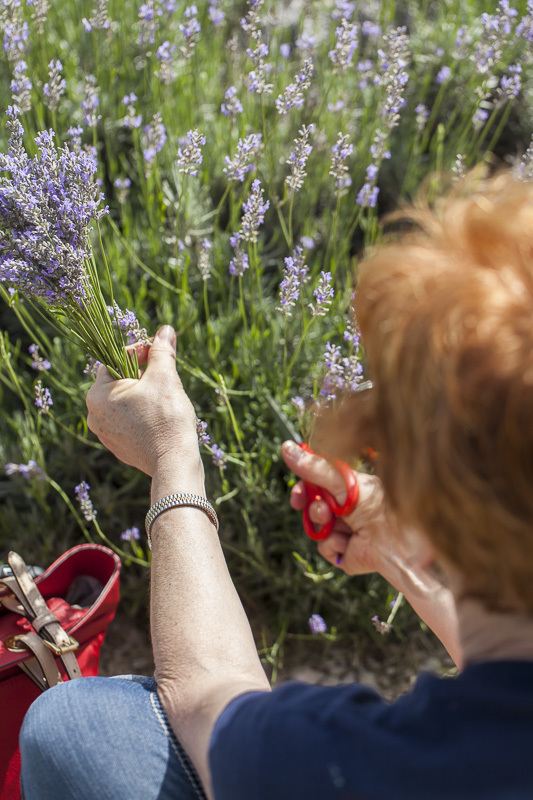 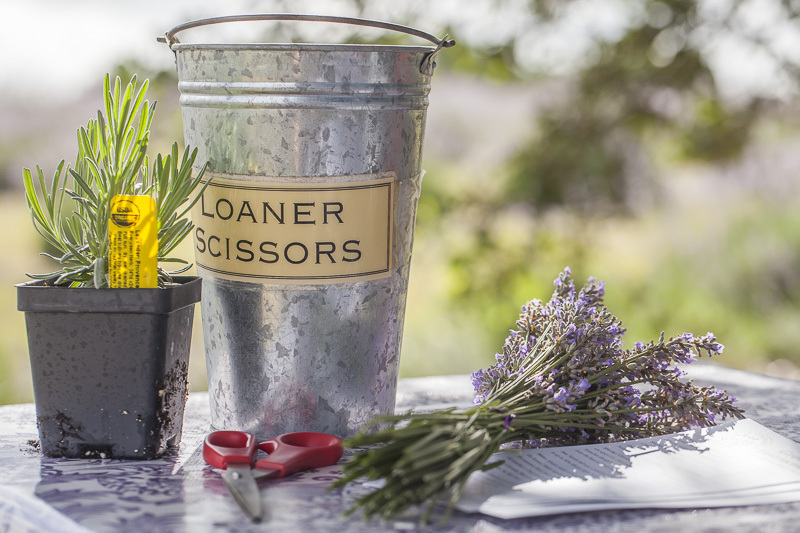 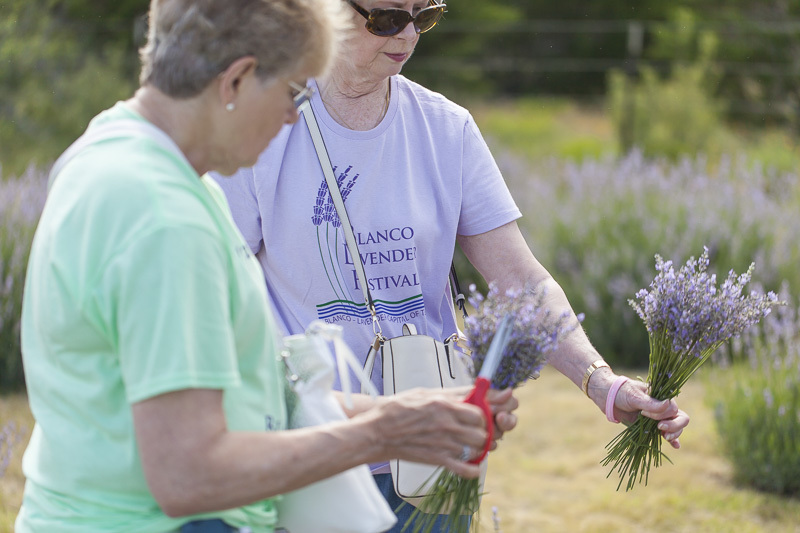 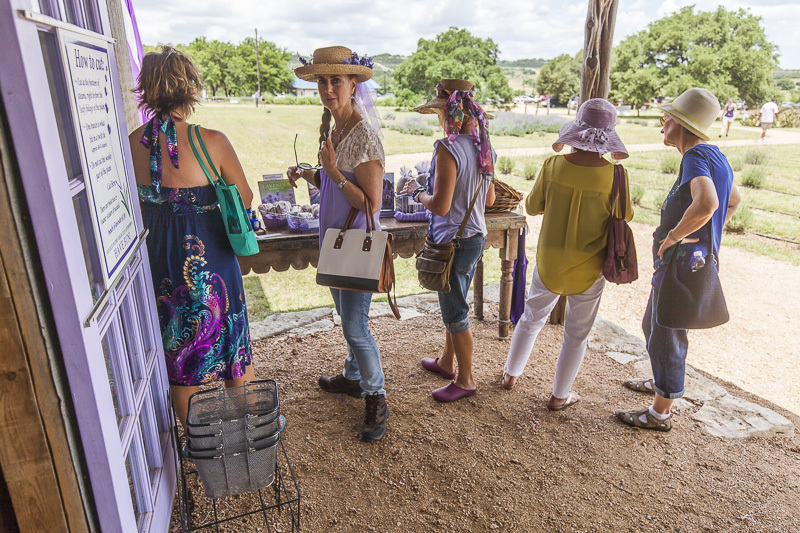 My next blog post will be about my recent trip out to Blanco for the Lavender Festival.